20ft x 10ft Fine Rustic Jute Burlap Backdrops Some gatherings have more impact because they are outside the big cities which give way to the more free spirit outdoors with tall trees, endless grasslands and add in some serene ponds, rivers and waterfalls. And weve crafted this unique party/ambiance linen to exude luxury while still blending in with the humble surroundings. Introducing the Jute/Burlap Backdrop that is sure to exude a classy taste while definitely blending in alongside the beautiful country look you've come to enjoy. Made with sturdy fabric and styled for a charming appeal, make sure to buy one for your upcoming big event. Why Buy? This is perfect for a complete rustic look that can't be found elsewhere and will surely place you on the map. Additional Information: -dimensions: 20ft wide x 10 ft height -included material: 2 layers -top layer chiffon, second layer jute/burlap -edges: serged -Backdrop comes with special 3 diameter rod pockets for easy slide- in/slide-out of curtain rods *note: sale is for 1-pc backdrop linen only. Fairy lighting and additional fabric bolts NOT INCLUDED. Note: Burlap material has an unique smell and is unavoidable. This is not a defect, and is actually indication that this is 100% authentic burlap material. The smell can dissipate some by leaving in open air, but may still be noticeable. Please keep this in mind when ordering. 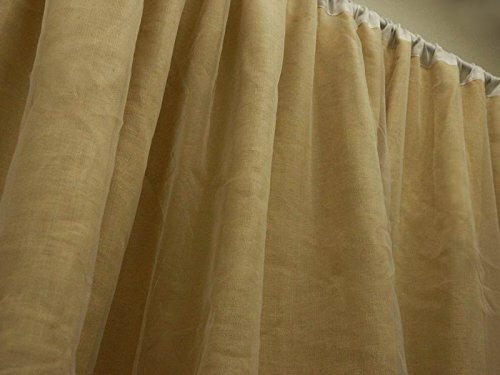 Material: Metallic Spandex Size: 20ft wide x 10 ft height Edges: serged Color: Champagne How to Care: Dry Cleaners only. Do not bleach *note: sale is for 1-pc backdrop linen only. Fairy lighting and additional fabric bolts NOT INCLUDED. If you have any questions about this product by Efavormart, contact us by completing and submitting the form below. If you are looking for a specif part number, please include it with your message.